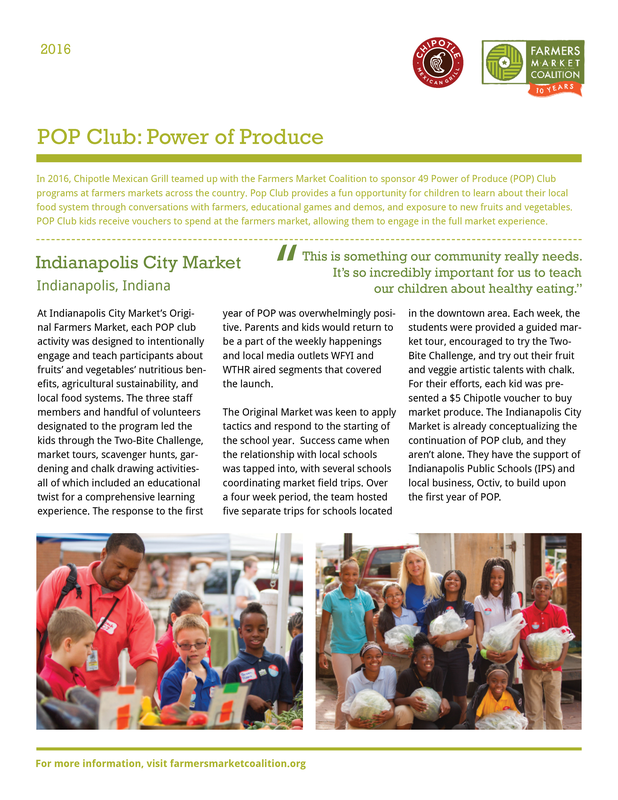 The Power of Produce (POP) Club provides a fun opportunity for children to engage in the local food system through conversations directly with farmers, educational games and demonstrations, and exposure to new fruits and vegetables. 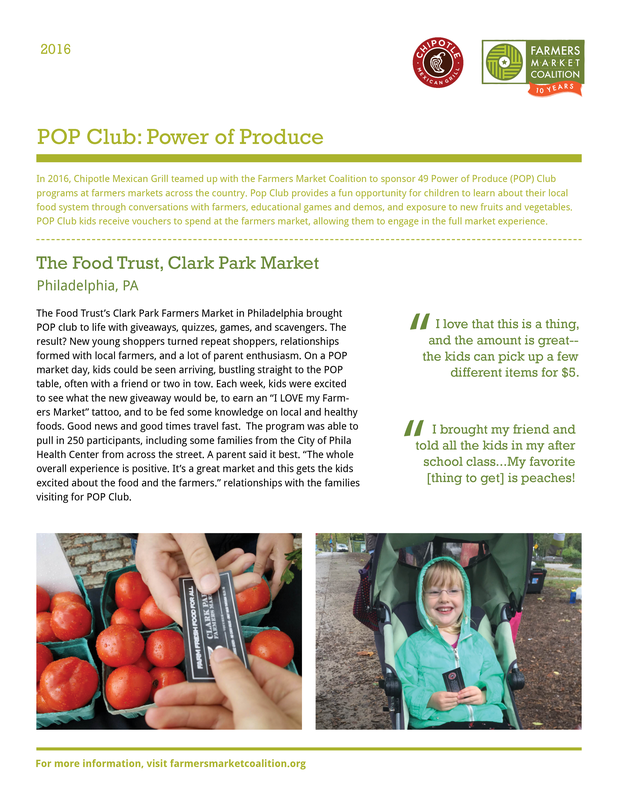 In addition to participating in educational activities, POP Club kids receive vouchers to spend at the market, allowing them to make their own shopping decisions at the market. POP Club Guidebook featuring activity guides and planning tools. 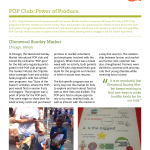 POP Club Activity Guide with over 50 children’s activities to do at the market. $2 POP Buck Template. 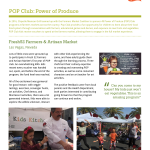 Use their existing tokens, or print out FMC’s POP Bucks for kids use to shop at the market’s participating vendors. Markets are responsible for reimbursing participating vendors. 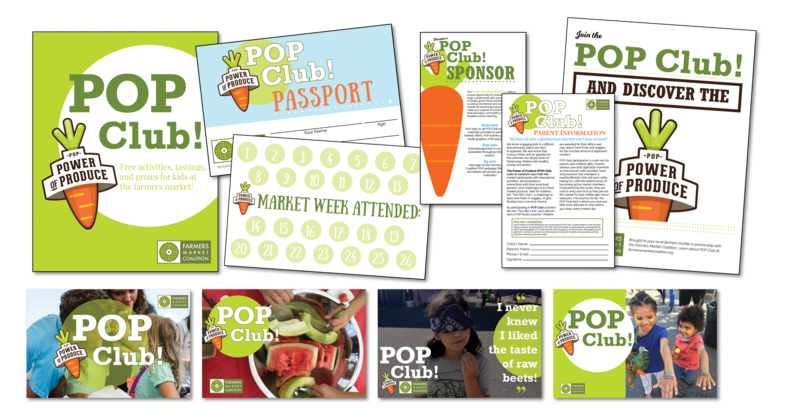 Tools and templates for promoting POP Club, including social media graphics, fliers and signage. Markets can use the templates as is, or get creative and customize them with their own activities. POP Passport. 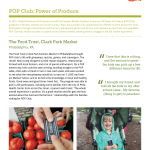 Each POP Club kid gets a POP Passport book to track lessons learned, and document new foods tasted and activities completed. Prizes for kids participating in POP Club. Stickers, temporary tattoos, tote bags and other goodies will be available for purchase at FMC’s online store. Members get 20% off. A POP Club Facebook Group Connect with other POP Club organizers to discuss programming, and share ideas! You will need to log in with your FMC member credentials. Not sure what those are? If you don’t have your credentials, you can recover them using the ‘reset password’ option from the log in page. You will need to use the email address associated with your FMC account to log in, or to receive the reset email. Have more questions? Go to our Membership Log In FAQs. 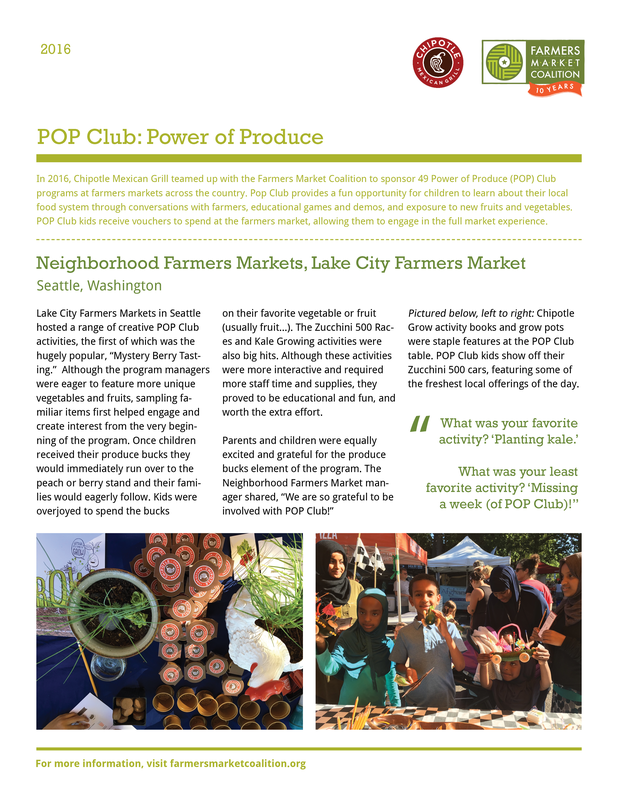 The Power of Produce (POP) program has stood out as having the potential to impact farmers market accessibility on a broad scale. 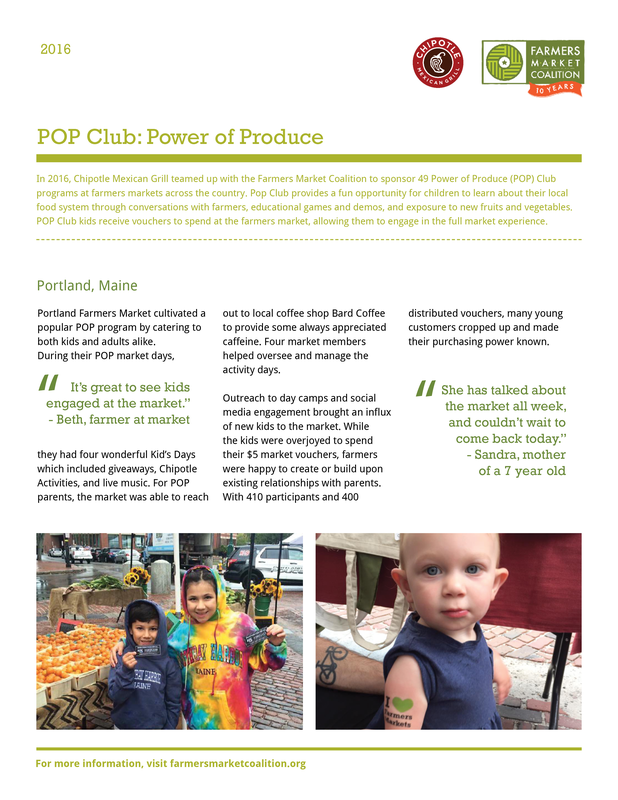 POP started in May 2011 at the Oregon City Farmers Market in Oregon City, Oregon. It was created by the market manager, Jackie Hammond-Williams in response to a grant offered by Clackamas County, Oregon for programs that improve the community’s health. 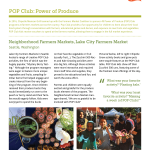 The POP Club brought together families and farmers around fresh produce at farmers markets. 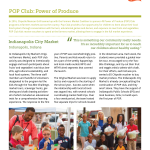 The program’s mission was three-fold: (1) Empower children to make healthy food choices (2) Strengthen and sustain healthy communities through supporting farmers and cultivating future farmers market supporters (3) Expand farmers markets from a retail location into a place where children can try new foods and learn about healthy eating. 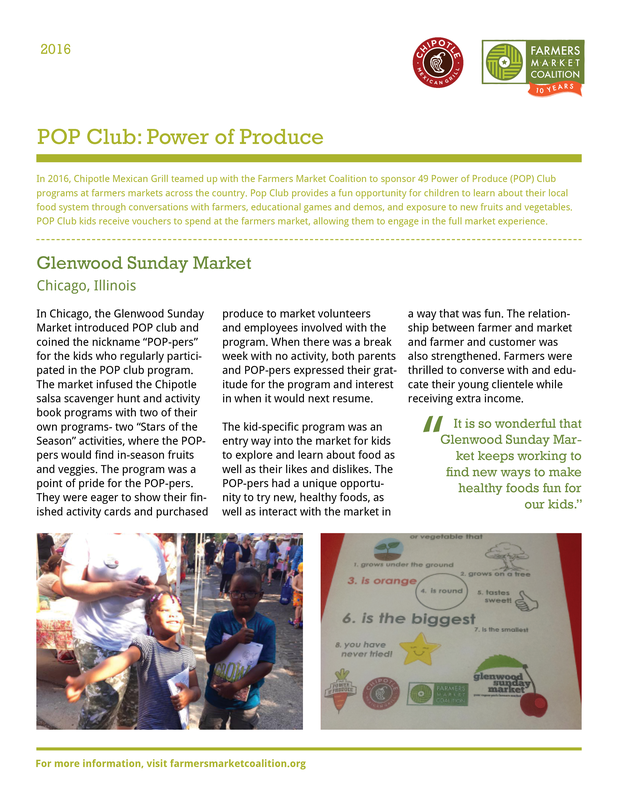 POP empowered children ages five through twelve to make healthy food choices by offering educational activities, cooking demonstrations, and food sampling, in addition to providing each child with at least two dollars in market currency to spend on fresh produce. 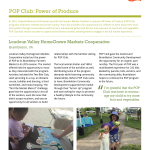 This incentive provided an effective way for children to engage in the local food system through conversations with farmers, buying local, and understanding the importance of healthy food choices. 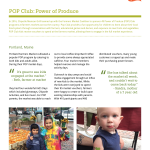 Through surveys and interviews, evaluations of Oregon City’s program found that 72% of POP participants had tried a new fruit or vegetable through the POP program. These newfound foods ranged from currants to gazpacho. Of participant parents, 70% reported that their child requests produce that he or she tried through the POP Club, confirming the influence of children on their parents’ purchasing choices. 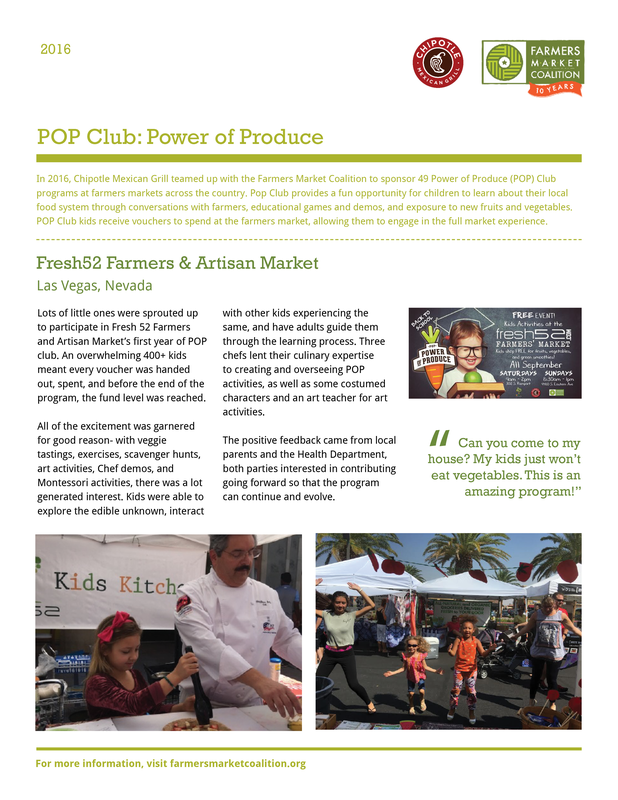 All of the vendors interviewed said that they had seen sales increase 35% due to the POP Club. 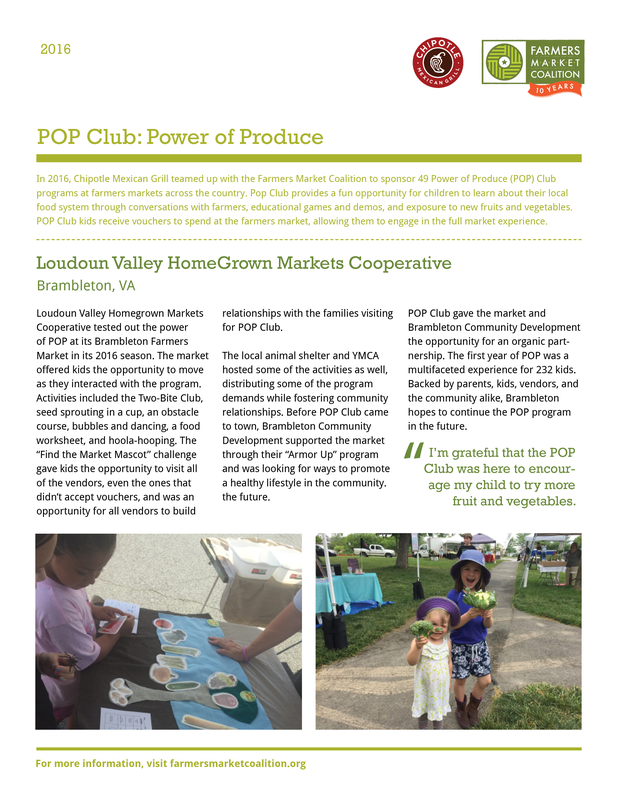 The following year, a POP Club was piloted at the City Market in Charlottesville, Virginia, only two blocks from a large subsidized housing neighborhood. Even with new demographics, the program had similar positive effects on interest in healthy food among children and their parents. By experiencing healthy foods in different ways (eg. touching, tasting, observing their peers eating, and preparing the food themselves), 88% of the children responding to the survey in Charlottesville reported that they tried a new food and liked it. Chipotle is proud to support farmers markets in their efforts to educate consumers and create opportunities for farmers. For more than two decades, Chipotle has been committed to Food With Integrity, which is the company’s commitment to better food from better ingredients raised and grown with a respect for farmers, animals and the environment. Read more about Chipotle’s Food with Integrity commitment here. 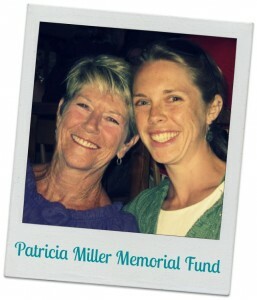 Support from the Patricia Miller Memorial Fund has also helped to bring the POP Club to life. The fund was created in memory of FMC Program Advisor, Stacy Miller’s mother, who was a great supporter of FMC and often a cheerful presence during FMC meetings, caring for her grandson Fionn.